LONDON (Reuters) - Tesco, Britain's biggest retailer, could axe 9,000 jobs in its UK stores and head office with its latest move to simplify operations and achieve targeted cost savings. It estimated that half of that number of workers could be found alternative roles across the business, limiting the impact on staff. Tesco, Britain's biggest private sector employer with a staff of over 300,000, said the main change in its stores would be to its fresh meat, fish and delicatessen counters. It expects to close counters in about 90 stores, with the remaining 700 trading with either what it called "a full or flexible counter." Tesco's move shows its operation diverging from rivals such as No. 4 player Morrisons, which emphasises its army of trained butchers, fishmongers and other specialists who prepare food in-store. Tesco said that contrary to media reports it did not plan to make any changes to its in-store bakeries this year. But it said it did require fewer staff for stock control, merchandising and at its head office. Those employed by third party caterers serving hot food in Tesco staff rooms would also lose their jobs as the retailer cuts that service. All of Britain's big four food retailers - including No. 2 Sainsbury's and No. 3 Asda who want to combine - are chasing efficiency savings to fund price cuts so they can better compete with discounters Aldi and Lidl, who are still winning market share. Tesco set out a plan in October 2016 to reduce operating costs by 1.5 billion pounds ($2 billion) over three years through efficiencies in its distribution network and stores and from procurement savings. It needs the cost savings to help achieve its target of a group operating margin of 3.5 percent to 4.0 percent by the 2019-20 financial year, up from 2.9 percent in 2017-18. 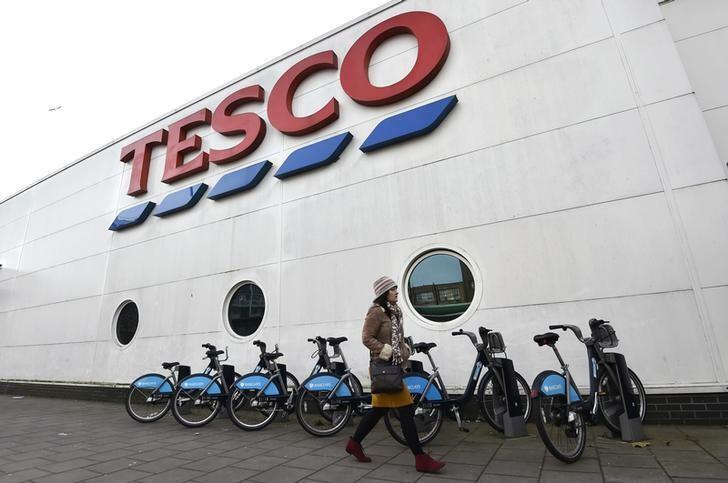 Bernstein analyst Bruno Monteyne estimated the cost savings of Tesco's latest programme to be 150 million to 170 million pounds a year, with a 50 million pounds restructuring charge taken in the 2018-19 accounts. He reckons 70 percent of the benefits will be felt in 2019-20, leaving further margin upside for 2020-21. "Anybody doubting the Tesco margin recovery should think again," he said. Shares in Tesco, up 5 percent over the last year, were down 1.5 percent at 1535 GMT.